Ear infections can be chronic or acute. Acute ear infections are painful but short in duration. Chronic ear infections do not clear up, or they recur many times. Chronic ear infections can cause permanent damage to the middle and inner ear. Ear infections occur most commonly in young children because they have short and narrow Eustachian tubes. Infants who are bottle-fed also have a higher incidence of ear infections than their breast-fed counterparts. On the whole, an ear infection occurs basically when your Eustachian tubes get blocked or even get swollen. When this happens, the ear gets infected. • Ear ache can also lead to loss of sleep and fever. Usually thick, yellow coloured discharge oozes out of the ear when the ear drum is infected. If the eardrum is blocked but is not infected it gives a feeling of ears being plugged in. Most of the ear infections can be prevented by maintaining proper hygiene like washing hands very often, avoiding crowded areas, forgoing pacifiers for infants and also avoiding smoking. An ear infection can occur in any of the three parts. Inner ear infections are the most serious. It is important to treat an ear infection to prevent complications, including damaging or rupturing the ear drum. 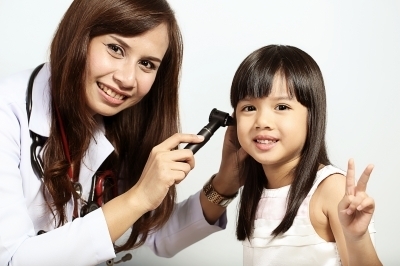 Untreated ear infections can also lead to chronic recurrence and can even cause deafness! It is important to consult a doctor, but for immediate relief you can try some natural treatments. There are many time-honoured, simple and easy home remedies that can help to get rid of the pain and other symptoms of an ear infection. Salt is probably the most readily available home remedy. Heat up one cup of salt on a pan over low heat for a few minutes. You can also heat it in a microwave or double-boiler. Repeat this remedy daily as many times as needed. The heat generated from the sock will help draw out fluid from the ear and relieve swelling and pain. Garlic has antimicrobial properties and natural pain relieving qualities, making it highly effective in the treatment of ear infections. There are a few ways to use garlic as a home treatment. Make garlic oil by cooking two garlic cloves in two tablespoons of sesame oil or mustard oil until it turns blackish. Strain the solution. When it is bearably hot, use two to four drops of this oil in the infected ear as ear drops. Alternatively, you can also boil two or three fresh garlic cloves in water for five minutes, then crush them and add some salt. Put the mixture in a clean cloth and place it against the affected ear. To get rid of the fungus that may be causing the ear infection, apple cider vinegar is a good option. Mix one part apple cider vinegar with an equal amount of water or alcohol. Soak a cotton ball in the solution. Remove the cotton ball and lay down on your opposite side to drain the liquid from the ear. Use a hair dryer to dry your ear as much as possible. If apple cider vinegar is not available, you can use white vinegar. If the cause of the ear infection is in the Eustachian tubes, try gargling with apple cider vinegar. An ear infection, or (Roy Benaroch, Understanding Ear Infections: Diagnosis and Treatment), is the most common cause of earaches. Although this condition is a frequent cause of infant distress and is often associated with children, it can also affect adults. If your baby turns fussy, or starts crying more than usual, be on the lookout for a problem. If he develops a fever (whether slight or high) you have another big clue. Ear infections tend to strike after a common cold or sinus infection, so keep that in mind too. Sometimes an ear infection can also be caused as a result of ear injury which can happen due to sudden pressure changes like a blow to the ear. Ear infections often follow a cold. Bacteria or viruses are the likely culprits. Whether it is via the salt remedy or the garlic cloves, warmth does wonders for getting the lymphatic fluid moving and easing the discomfort of earaches. Crush up 1 or 2 garlic cloves whole and put it in a jar or cup with a few tablespoons of olive oil (or jojoba/almond oil if you have it) and heat it in the microwave for just 10-20 seconds... it will get hot FAST. Then drop a few drops into your sore ear and put a cotton ball in and leave for about 1/2 hour. You can do this 3-4 times a day if you like. This can be a serious problem unless you get it treated quickly and properly. Don't waste your time with silly invented 'cures', see a proper doctor.